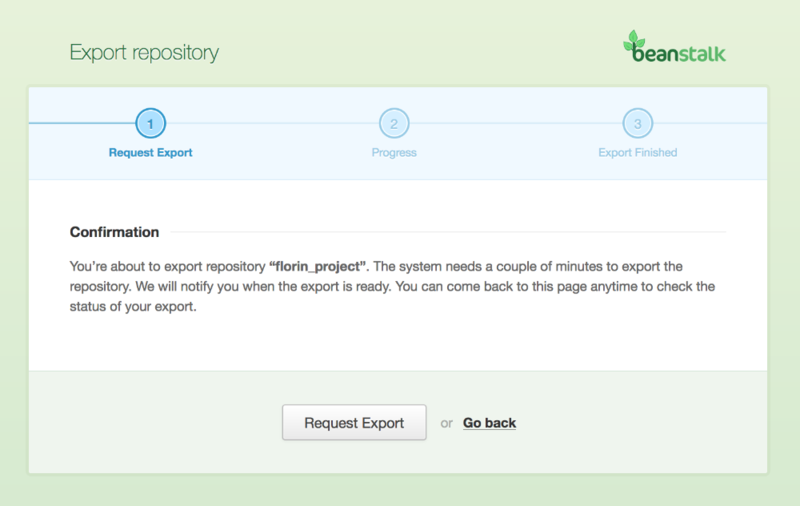 Yes, each Beanstalk repository can be exported at any time, at no cost. The export contains an SVN dump file of the repository. This exported file can be imported into another Subversion server and will retain the complete revision history. Only repository admins or Beanstalk account owners can export a repository. After clicking Request export, You will see a short notice and we will start exporting your repository. When exporting is finished you will see a file that can be downloaded, which contains the exported repository. If you want to download the file later and you want to be sure that it contains the latest files from the repository, you can click the refresh link next to the file name. After clicking refresh link, your repository will be exported again, in case there were any changes to the repository files. You can leave Export repository page by clicking I’m done, take me back.